The following videos demonstrate the correct technique for implanting the titanium K-Helix Prostheses in the middle ear. All implants were performed in a fresh left temporal bone. The facial recess was opened widely. A 3 mm. segment of the long process of the incus was removed with a diode laser. All high definition videos are in real time. The vertical descending segment of the facial nerve was removed in order to be able to video the K-Helix Piston positioned on the footplate. The Kraus K-Helix Prostheses are made of light weight porous titanium. There are five (5) proximal conical helix coils, numbered from distal to proximal. The K-Helix Piston has distal cylindrical coils for adjustability. The helical coil design of the K-Helix Prostheses permits custom adjustment in the OR to fit the patient's anatomy. The helical design is not meant to facilitate the application of any tension or bias on the ossicles. In other words, the helical coils are not "springs" to help stabilize the prostheses. The application of any spring tension or bias on the ossicles will cause an undesirable loss of sound transmission and lead to clinical hearing loss postoperatively. It is recommended that the K-Helix prostheses be grasped by the proximal coil with a toothed alligator forceps. The prosthesis should be implanted adjacent to the incus or malleus handle, the coils slid over the incus or friction fit to the malleus handle, and then the crown positioned onto the stapes capitulum or the piston centered on the footplate (or placed in a stapedotomy). Implantation may be performed either transcanal or transmastoid facial recess. If a facial recess approach is used, the facial recess must be enlarged enough to permit passing the prosthesis through the recess. In clinical use, the transcanal approach works very well. An optional double-ended instrument, the Kraus Incus Sizer, is in development. The instrument will have a loop on each end. One loop is the diameter of coil #5. The other end loop is the diameter of coil #1. By slipping the loop over the incus, the surgeon will be able to determine the diameter of the incus in relationship to the diameter of the coils. Grasp the K-Helix Crown at the junction of the coils and crown with a delicate alligator forceps with teeth (such as an X241 model). Slide the coils over the eroded incus and rest the crown adjacent to the stapes. The K-Helix prostheses may then be manipulated using two surgical picks. The proximal coils should be slid over the incus and then the crown is elevated and "landed" on the stapes capitulum. The crown may be manipulated with a delicate 90 degree footplate pick. If the prosthesis needs to be removed, the crown should be lifted off the stapes capitulum. Then, the coils should be removed from the incus. When used malleus-to-stapes, the proximal coil (coil #5) should be removed. A House-Dieters Malleus Nipper (Storz Instrument Catalog #X0569) is the best instrument for this purpose. The coil cut should be made at six o'clock along the coil. After the proximal coil is removed, the space between coils #3 and #4 is widened with the shaft of a surgical pick. The spread coil configuration is used to "paper clip" the coils to the malleus handle. Optimal placement of the coils is as close to the umbo (distal handle of the malleus) as possible. It is not necessary to dissect the tympanic membrane off the malleus handle. The coils should be engaged with the malleus handle. Then, the crown should be "landed" onto the stapes capitulum. If it is necessary to removed the prosthesis, the crown should be lifted off the stapes capitulum prior to disengaging the coils from the malleus handle. Mobile Footplate: The proximal coils are positioned on the incus as described above for the K-Helix Crown incus-to-stapes implantation. The distal piston tip (0.6 mm diameter) is positioned in the center of the footplate, without tension. The 0.6mm Dornhoffer footplate shoe may be used to help maintain footplate centering. * Great care should be exercised to avoid applying any excess tension to the footplate. The tip should rest gently on the footplate without tension. The footplate should not be depressed to any degree. *Inventor's Note: During revision stapedectomy, there may be a very thin neomembrane present. If the surgeon decides to augment the existing neomembrane with a tissue graft (such as vein, pressed fascia or perichondrium, etc. ), a small graft just covering the oval window is recommended when using the K-Helix Piston. 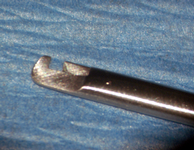 A large graft may inadvertently "fold-up" around the shaft of the piston causing delayed partial or complete fixation and a residual air-bone gap. Fixed Footplate: If the footplate is fixed, a 0.6 mm stapedotomy may be performed. The distal piston tip is marked with a groove guide 1.0 mm from the tip. The tip is placed in the stapedotomy/vestibule to the 1.0 mm mark. When used in this fashion, it is mandatory that the proximal coils be cemented to the incus (or malleus handle if used malleus-to-footplate) in order to provide a fixation point for the prosthesis. A prosthesis that is not fixed proximally could inadvertently become displaced into the vestibule. The Implantation sequence is the same as for the malleus-to-stapes above. First, remove coil #5. Open the space between coils #3 and #4 (spread the coils apart to make enough space to engage the malleus handle). Position the proximal coils medial to the malleus handle, with coil #4 anterior to the malleus handle and coil #3 posterior to the malleus handle. Gently life the coils from medial to lateral and engage the space between the coils with the malleus handle. Carefully, position the piston on the footplate (may use optional 0.6 mm Dornhoffer footplate shoe). the proximal coils and bone (incus or malleus handle - depending on how which K-Helix prosthesis is being used and in what configuration). The proximal coils will "grab" the cement and help to direct the cement around the circumference of the incus and malleus handle. The cement used in the video (and in the OR) is glass ionomer cement. It is used for 2 minutes and hardens in 4 minutes, under normal OR conditions (humidity, etc). Glass ionomer cement (GIC) bonds well to titanium and to bare bone. GIC is hydroscopic and will not bond to mucosa. Excessive moisture in the operative field will weaken GIC polymerization and prevent proper curing and bonding. Both mucosa and excessive moisture should be removed prior to applying GIC. Do not apply glass ionomer cement to the footplate or use with an open vestibule. CSF aluminum toxicity is possible. Hydroxyapaptite cement (HA) is not recommended for use with the Kraus K-Helix Prostheses. HA is difficult to apply due to its watery consistency and tends to "migrate" during healing, especially in chronic ears.